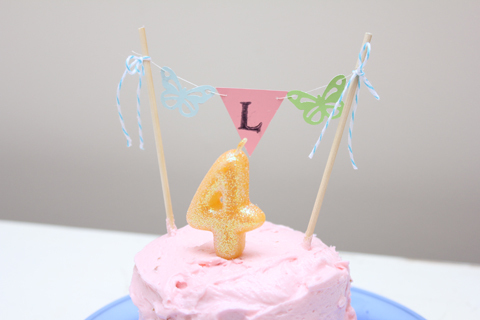 Our special four year old was lucky enough to have three celebrations this year... one at school, one with family (on the very day), and one with friends (the weekend after). And, each got her a different version of my go-to cake recipe, Magnolia's Vanilla Cupcakes from More from Magnolia, with Rachel Ray's icing recipe—which, by the way, is honestly the best cupcake frosting I've ever had. I make half the recipe. 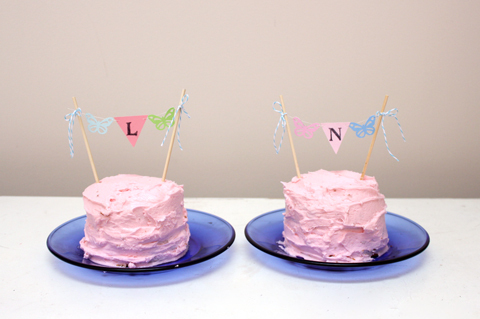 I made mini two-layer cakes for her birthday dinner at home. 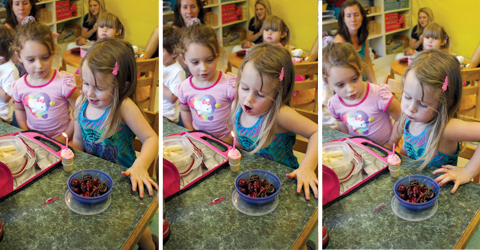 She shares her birthday with her Nona, so they each got one—with their own mini cake-banner, too. I used my Martha Stewart butterfly punch, baker's twine and my ubiquitous Cavallini and Co. Alphabet Stamps. 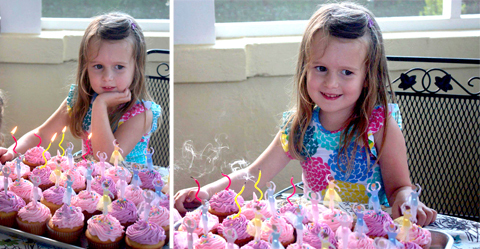 Out of the same batch of batter and frosting, I made ice cream cone cupcakes for her to bring to preschool. These were the traditional treat for my husband's school-birthdays, so we decided to carry it on. 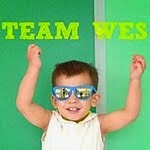 I got mini ice cream cones (at Target) to make them more preschool portioned. 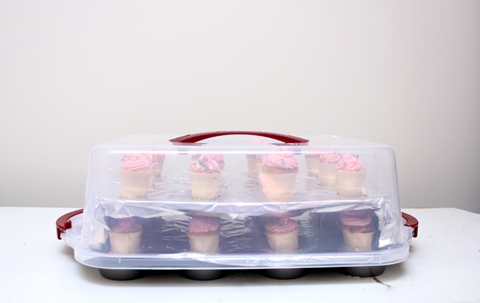 To make these, stand the empty ice cream cones in a muffin tin (or a mini-muffin tin), fill them two-thirds or so with batter, and bake as usual. 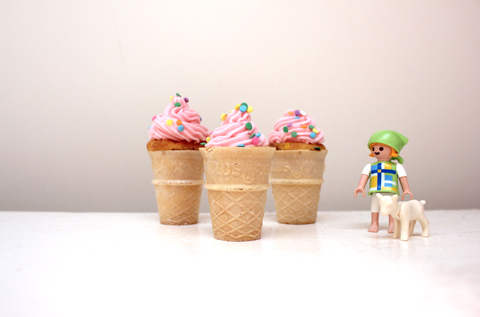 I piped the icing on and dipped them in sprinkles to make it look like (pink) soft-serve. 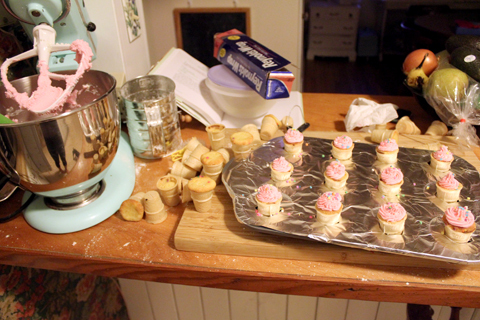 Finally, for the friend party, I made regular sized cupcakes—same recipes, of course. 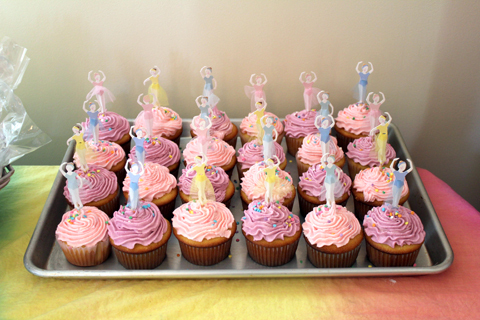 The ballerina toppers were by Meri Meri (although I bought them last year). 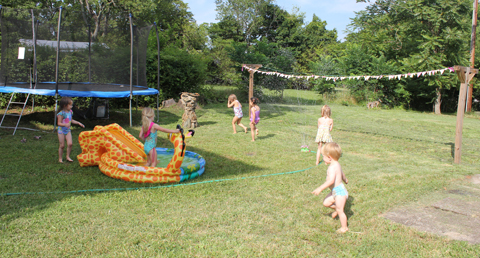 We decided to go with the age=number of guests rule (4 friends for a 4-year-old) this year, and had a simple sprinkler/kiddie pool/trampoline party in the backyard. She had a blast and we did too.